Discussion will focus on Visual Thinking Strategies (VTS) and its applicability with adults. Towards the end of the presentation, Hope will facilitate a discussion with the audience using a contemporary work of art. As the School Programs Coordinator, at the Lowe Art Museum, University of Miami, Hope has implemented and managed the Visual Thinking Strategies (VTS) for two schools participating in the Miami Dade County Public Schools Museums Magnet Program. 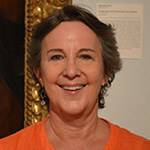 She has developed an innovative and interdisciplinary program at the University of Miami that uses VTS and art to hone observation and communication skills in the service of clinical diagnosis. Working in partnership the Lowe Art Museum, Miller School of Medicine, School of Nursing and Department of Psychology have filled a gap in medical education to strengthen healthcare. VTS enables audiences, of any age, to engage in meaningful discussions about works of art. As the School Programs Coordinator, at the Lowe Art Museum, University of Miami, Hope has implemented and managed the Visual Thinking Strategies (VTS) for two schools participating in the Miami Dade County Public Schools Museums Magnet Program. She has developed an innovative and interdisciplinary program at the University of Miami that uses VTS and art to hone observation and communication skills in the service of clinical diagnosis. Working in partnership the Lowe Art Museum, Miller School of Medicine, School of Nursing and Department of Psychology have filled a gap in medical education to strengthen healthcare.